HP Pavilion Dv7 Laptop. Condition is Used. Has a few small marks and scratches but nothing that affects use. Includes a dvd and USB ports, headphone ports, HDMI port, beats audio speakers, built in web cam and microphone, intel core i7 and Radeon graphics. Has 8GB RAM. Comes with a laptop bag and a charger. Dispatched with eBay delivery – Shutl 1 day. HP PAVILION DV7-I7-Q720@1.60GHz-4GB RAM-500GB HDD-Beats Audio Edition-Windows 7. HP PAVILION DV7. Product Line:DV7 Beats Audio. 4GB RAM/500GB HDD. Beats Audio Edition. Windows 7 Pro. COA:Windows 7 Pro. Hard Drive Capacity:500GB. NO COLLECTION IN PERSON IS AVAILABLE. BullGuard Internet Security Antivirus 1 Year 3 Device Protection Easy To Use. BullGuard Internet Security. 3 Device Protections. · 500GB (HDD). TROB: 1547640837-124 HP PAVILION DV7-3111EA REF-GR-C HP BUNDLE. No charger no HD Hp Pavilion DV7 Entertainment Spear Or Repair. Condition is For parts or not working. HP WIDESCREEN LAPTOP. HP WIDESCREEN WEB CAM LAPTOP. FRESH INSTALL OF WINDOWS 7 READY FOR NEW USER TO USE. HARD DRIVE:500 GB. BLU RAY DVDRW DRIVE INSTALLED. WHAT YOU WILL RECEIVE WIFI:BUILT IN. Brand: HPProcessor: Intel Core i7 2nd Gen.
HP Pavilion dv7 AMD Turion X2 Dual-core RM-75 2.20 Gaz 2GB RAM 80 GB HDD Windows 7 No charger..... No battery..... Free delivery....... Thanks and please check my other listing !!!! 1TB HDD - £75.00. - NVIDIA GeForce GT 620M Dedicated Graphics Card. - Turn your HP Pavilion dv7 into your own super-hero capable of conquering your most demanding challenges. Choose between powerful graphic options, major storage, and accelerated processing. HP Pavilion DV7 LAPTOP. This laptop is sold as seen for spares or repairs only. It is not a working computer in its current state. This laptop has a working 17.3" LCD display although a few pixels appear to have failed. HP Envy DV7T 6C00 CTO Quad Core i7 2670QM 2.2/3.1 Ghz Dedicated ATI Video. Envy DV7T 6C00 CTO. 1TB SATA 3 Hard Drive. ATI Radeon 6700 series Dedicated Graphics. (NOTE 1 ) To facilitate Switchable Dedicated ATI Videos, Windows 7 Ultimate 64 is loaded.Windows 10 does not support Switchable Videos any longer. HP Pavilion DV7-4150ea 17.3" (500GB HD Intel Core i5 M460 2.53GHz, 8GB) Win 10. 500Gb Hard Drive. HP Pavilion DV7-4150EA. lease do not hesitate to ask. This is a used laptop and does have a couple of very light marks on top of the lid. Open Office Suite. Wordprocessor, spreadsheet, database etc. HP Pavilion DV7-6154ea 17.3" (750Gb, Intel Core i7 2nd Gen 2.00GHz, 8GB) Win 10. 750Gb Hard Drive. HP Pavilion DV7-6154ea. Open Office Suite. Wordprocessor, spreadsheet, database etc. lease do not hesitate to ask. This is a used laptop and does have a couple of very light dings on top of the lid. HP Pavilion DV7-6000 DV7-4000 DV7-4100. Screen Panel Display Screen. Slab LED 17.3". Our products Photo / Video. La TVA (19,6%) est récupérable pour les professionnels. Dépôt Espèces (dans n’importe quelle agence BNP Paribas). ORIGINAL HP battery / COMPAQ. ORIGINAL HP. HP Envy 17 - 1001TX. HP Envy 17t-1000 CTO. HP G42 - 243 CL. HP G62-110ED. HP G62-130SD. HP G62-a11SD. HP Pavilion DV7-6000 DV7-4000 DV7-4100. Screen Panel Display Screen. Slab LED 17.3". NEW PRODUCT. Our products Photo / Video. La TVA (19,6%) est récupérable pour les professionnels. Dépôt Espèces (dans n’importe quelle agence BNP Paribas). HP Pavilion Dv7-4040ss For PARTS. Is booting but after 1 min and a few seconds turns off. Some electronic malfunction on motherboard. It can be fixed I think.. Don't know exactly.. Full specs here https://support.hp.com/us-en/product/HP-Pavilion-dv7-Entertainment-Notebook-PC-series/4149935/model/4207690 Condition is For parts or not working. Dispatched with Royal Mail 1st Class. Brand: HPProcessor: Intel Core i7 1st Gen.
Pavilion dv7-3057nr. The above item is being sold as “Spares or Repair”, so “NO” Warranty will be applied to the product. Includes Hard Drive Cover / Caddy Top Casing Condition Bottom Casing Condition. HP Pavilion DV7-4045ea DVD-RW. Product Line: Pavilion. Taken from a DV7-4045ea. Type: Notebook/Laptop. AMD Processor. For Spare or repairs only. 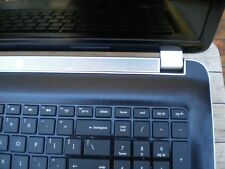 Hp Pvilion DV7-4065dx Laptop. Blueray Present. 17" Good Working Screen. See pictures closely as this is exactly what you will receive! HP Pavilion DV7-4045ea 17.3" AMD Phenom II Quad Core P920 1.6Ghz(500GB HD, 4GB). AMD Phenom II Quad Core Processor 1.6 GHz. 500Gb Hard Drive. HP Pavilion DV7-4045EA. Open Office Suite. Wordprocessor, spreadsheet, database etc. 17.3" Glossy Wide Screen. Microsoft Defender. (Virus, Spyware Etc Checker). Product Line: Pavilion. Screen Size: 17.3". Tested and Working. Product Line: Pavilion. Screen Size: 17.3". Type: Notebook/Laptop. HP Pavilion DV7-4045ea Left and right Speakers and Sub Woofer. Product Line: Pavilion. Screen Size: 17.3". Type: Notebook/Laptop.